Once your YNAB subscription starts, you'll see the option to Share YNAB. 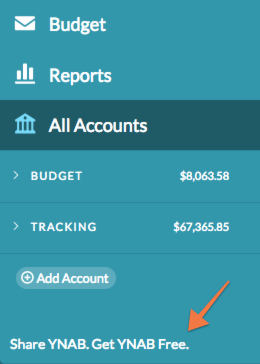 Get YNAB Free. in the lower left corner of the web app. Your subscription hasn't started yet. If you subscribed before the end of your free trial, you won't actually be charged until you've used all your free time. 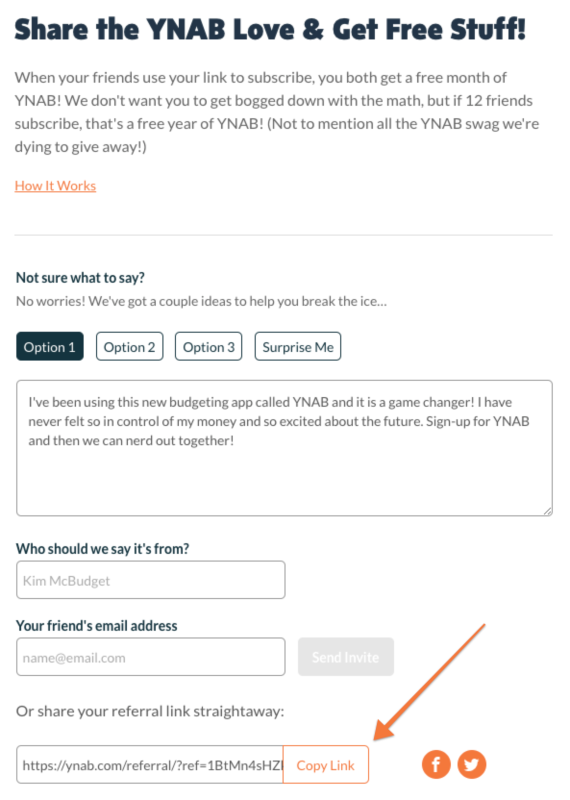 At that point, your subscription will start—and you'll see the option to Share YNAB! Your subscription is managed by iTunes. If you subscribed to YNAB on an iPhone or iPad, your subscription is managed by iTunes. It pains us to say it, but that means we don't have the ability to add free time to your account. That's why you won't see the Share YNAB link. But we hope you'll still share the YNAB love! The YNAB Toolkit is hiding it. If you've installed the (unofficial) YNAB Toolkit browser extension, you might have the Referral Banner hidden. All you need to do is click the YNAB Toolkit icon in your browser menu bar, Open Settings, and turn off the setting called Hide Referral Banner. You're on the mobile app. The referral link isn't currently available in the mobile app. Instead, use this link to open up Safari or another browser app. Log in and you'll land on the Referral Program dashboard! You can invite your friends by either sending them an email or copying your referral link to share wherever you'd like! As long as your friend or family member uses your referral link to sign up, you'll both receive a free month of YNAB if they subscribe. 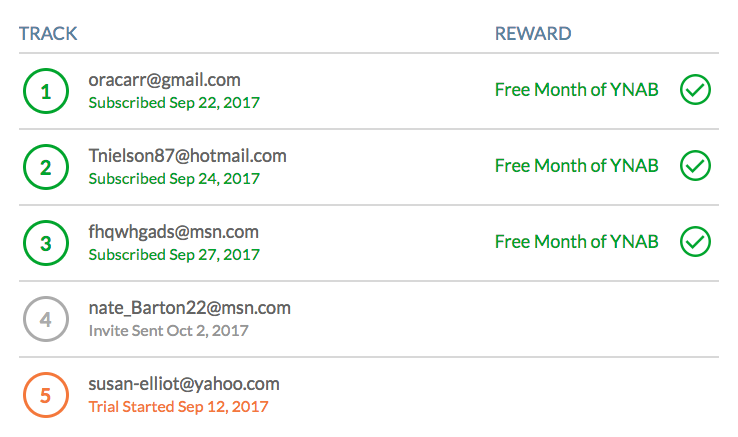 The free month will automatically be added to both of your accounts once their subscription starts (at the end of their free trial). We’ll even keep track of your friends who sign up and subscribe—and there's no limit! If your friend forgot to use your link—or if you forgot to use your friend's link—send a quick email to [email protected], and we'll get you both squared away!